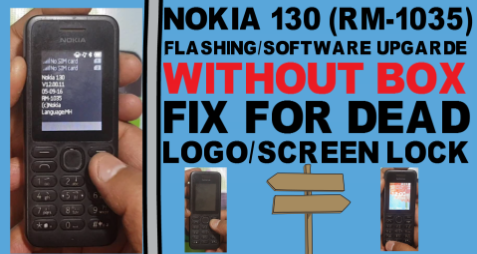 NOKIA 130 (RM-1035) FLASHING WITHOUT BOX FIX FOR DEAD/LOGO/SCREEN LOCK. NOKIA 130 (RM-1035) FLASHING REQUIRED FILE. 2# Download Stock Rom RM-1035. NOKIA 130 (RM-1035) FLASHING METHOD. 7# Copy stock Rom On products folder then change RM-1035 TO RM-1122.